Stanhope student apartments are scheduled to finish construction in early August, bringing more than 800 beds and 25,000 sq. ft. of retail space to Hillsborough Street. Stanhope is located at 3001 Hillsborough Street, across from Cup-A-Joe and expected to have primarily NC State undergraduates as residents. John Kane, the developer of Stanhope, is also the developer and owner of North Hills, an upscale outdoor shopping mall. Because of Kane’s reputation and success with North Hills, there is much anticipation for the opening of Stanhope. Kane Realty is offering students and faculty from the College of Design the opportunity to submit artwork, wall installations and sculptures for Stanhope. If selected, the creations will be permanent to the building. The deadline for submitting artwork is the end of March, and the winner will be chosen in April. Elyse Pizzella, a junior studying chemical engineering, will live in Stanhope apartments next semester. The two-bedroom rate at Stanhope is $805, while Valentine Commons’s two-bedroom rate is $750, and College Inn’s is $765. In addition to the residents, Stanhope will bring a commercial space below the complex. “I am extremely confident we are going to see whether it’s a cool new restaurant, bar and nightlife, some great new retail. The mix of businesses are going to be a great attraction to students,” said Murison. The Stanhope Development is just the beginning of the rejuvenation of Hillsborough Street, according to Murison. The City Council approved plans for Phase 2 of the revitalization of Hillsborough Street to move forward next month. The plans include new streets, a median, new sidewalks, new street furniture and lights. Construction is expected to begin spring 2016 and should take about 18 months to complete, according to Murison. “The city’s investment in $13 million in Phase 2 will add more gasoline to the economic engine that will attract more redevelopment,” said Murison. Developers hope the revitalization of Hillsborough Street will make it more user-friendly, safe and beautiful, as well as help private companies thrive. There are also other smaller developments currently taking place on Hillsborough Street. “We have six private sector developments going on Hillsborough Street that should be done in the next six months to a year,” said Murison. The construction on the corner of Dan Allen Drive and Hillsborough Street, in front of University Towers, is part of the six private sector projects this year. The building will be more premium student apartments, holding somewhere from 45 to 60 beds with retail commercial space on the ground floor. The building will be very similar to 2604 Hillsborough Street, the apartment complex above Saxby’s Coffee. 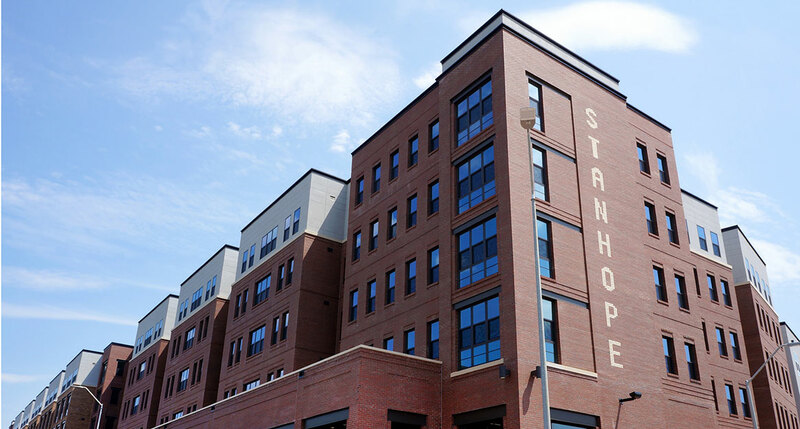 The same architect and developer from 2604 Hillsborough Street designed Stanhope apartments. Another part of the six projects on Hillsborough Street is the Aloft Hotel that will be located on the corner of Maiden and Hillsborough Streets across from the Bell Tower. According to Murison the hotel is expected to bring a metropolitan feel to Hillsborough. “What you are seeing is a very significant investment in Hillsborough Street over the next three to four years,” said Murison.